I didn't really like it. First off, I fell asleep maybe one third of the way in, once they were in the internet. When I woke up, Vanellope was with the Disney princesses, which was cute, but then she wanted to leave Ralph to be with a gang of drivers in a violent street race game. Disloyal. Not a good friend to Ralph. So I rate this a one star. And that's being generous. I can't believe he thought she was a friend of his after that. Friends don't ditch you. Again, John C. Reilly and Sarah Silverman hit the ball out of the park ! Such great writing and superb lighting in an animated feature. Exelente película con un mensaje hermoso! 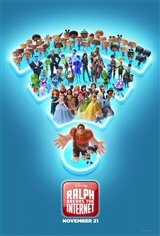 Ralph breaks the internet worst movie ever made! Fun movie for children but thr end was poorly written and very disappointing. A lovely friendship movie for the hole family. Some good laughs and great animation with a good leason of friendship. Definetly a fun watch for all ages. Cute, everyone should take their grandkids, maybe twice. It's nice to forget about all the junk going on in today's news. NO HATE PLEASE! Hollywood agenda yes but hay I did laugh 來 as Alex Trebek said its a scary time to be a Ralph! OOOOOKKKKKAAAAY..... we get it. Ralph is a dense galoot whose co-dependence is the cause of all problems. Vanillope's only "fault" was that she wanted out of the boring video game and out to experience a life of adventure. In case you missed it, we needed all the Disney princesses to come out all at once and whack us on the head to emphasize that Disney is trying to make every female character the strong lead who doesn't need an oafish man to rescue her from any situation-That is, other than try to make up for his own stupidity. It was hard to watch, simply because they didn't let you forget that you weren't just watching a fun cartoon movie; nearly every scene had to remind you of their stances on social issues and tried to convince you to think likewise. It was a fun movie to watch! A fun movie for anyone (adults too)! This movie was fantastic. No swearing.